Think you know sports trivia? Download HypSports and prove it. After you download the app, use TGT's special code (AVEQNT), for an extra life in Trivia Clash. 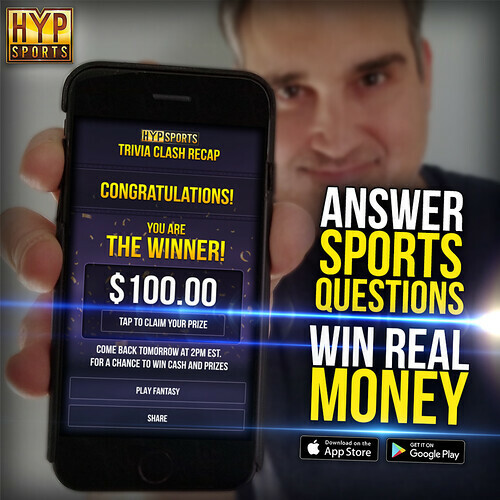 Each night at 8:30 PM ET HypSports' Trivia Clash will let users compete in a trivia contest where the winner can earn cash. Even if users fall short, each correct answer will award HypCash that can be used in the app's existing Daily Fantasy Sports component. Tonight's game (4/3/18) is at 8:30pm EST with a $200 cash prize. Each night that there is no winner, the grand prize increases for the following night. While not a traditional fan of Daily Fantasy Sports, I have been playing this app since November and regularly for the last few months. The format and low cost of entry makes it fun IMO. Basically, it combines DFS with card collecting aspects. Simply by being active (they give away free packs regularly throughout the day), you can get additional players and free HypCash (in-game currency). Can users buy packs/players with cash? Yes, but there are in-game limits to help prevent it from becoming a pay-to-succeed app/mode. Trivia Clash is a new feature that just debuted last night. The 12-question format is pretty quick, so it doesn't take much time to play. Hopefully you guys will give them a try and use TGT's promo code (AVEQNT) for an in-game boost.